We’d love your help. 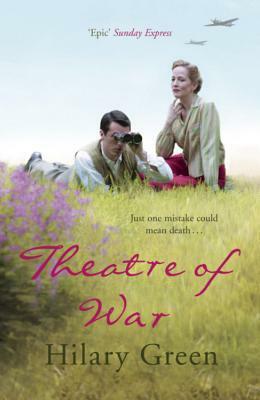 Let us know what’s wrong with this preview of Theatre Of War by Hilary Green. It is 1942. The theatres of war are North Africa and Italy. All eyes follow the front, but behind the scenes a messier war continues, an improvised game of snatched triumphs, terrible mistakes and terrifying uncertainty. Cabaret singer by night, spy by day, Richard risks his life to help British servicemen escape occupied France and get back to England. Rose leads a group of It is 1942. The theatres of war are North Africa and Italy. All eyes follow the front, but behind the scenes a messier war continues, an improvised game of snatched triumphs, terrible mistakes and terrifying uncertainty. Rose leads a group of dancers with mixed morals high-kicking to entertain the troops as Hitler's bombers roar in the skies above. Then she is given orders to join the forces in the field, destination unknown. To ask other readers questions about Theatre Of War, please sign up. I really think this series improves as I read each book- I really love Merry & Felix and love reading about them. I thoroughly enjoyed this once again,for me, a random pick up choice of book.I was very much into the story straight away and I also found it very poignant as well as matter of fact re the main wartime story. The ending has a good outcome for two characters but not so happy for others. I did not dislike this book in any which way but I didn't love it either. It was very informative and opened my eyes to a lot regarding the 'entertainers' during wartime but, to be completely honest, it bored me at times. I wish I could give this 3.5 stars but I went with 3 as I felt the .5 was closer to that than 4. Excellent writing with a great deal of detail and history about the people who entertained the troupes during ww2. I learned a lot about ENSA - how they entertained workers in factories as well as the troupes overseas. The characters were colourful and based on real life men and women which I had not known whilst reading the book. This is book 3 of 4 in the Follies Series. It's so well planned and structured with characters of great depth, the author makes the reader feel so involved and close to the experiences and emotions felt. Unmissable! I was unfamiliar with this author or this series but she concocted an imaginative look into the British/European/Egyptian WWII entertainers and their supposed activities (tragedies, loves and love lost between what you would expect of "show" couples)! Hilary Green is a trained actress and spent many years teaching drama. She has always written, producing novels, scripts for the BBC, and short stories, one of which one the Kythira Prize awarded by the Historical Novel Society. When not writing she gardens, rides horses, walks in the countryside and plays bridge as well as enjoying travel and has been round the world several times. Hilary is marr Hilary Green is a trained actress and spent many years teaching drama. She has always written, producing novels, scripts for the BBC, and short stories, one of which one the Kythira Prize awarded by the Historical Novel Society.